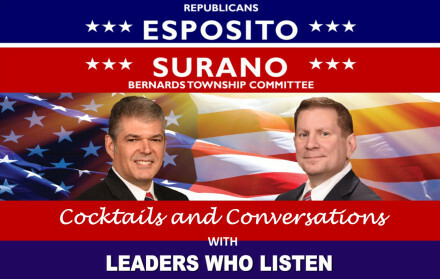 Meet your candidates for Bernards Township Committee and share YOUR vision for our town's future! Tickets will be available at the event for an additional $15 per person or $25 per couple. New Jersey Election Law allows contributions with a limit of $2,600 per election cycle from individuals and corporations, except those industries regulated by the State of New Jersey. PAC's may contribute up to $8,200 per election cycle. A Partnership may contribute a maximum of $2,600 per partner per election cycle. The check must be accompanied by a letter allocating the contribution to the individual partners. Contributions are not deductible for federal or state income tax purposes. New Jersey Election Law requires we collect the name, address, occupation, employer and employer's address for every individual contribution.